Cartoonist Rob Rogers poses for a photo in his studio in Pittsburgh, 2009. 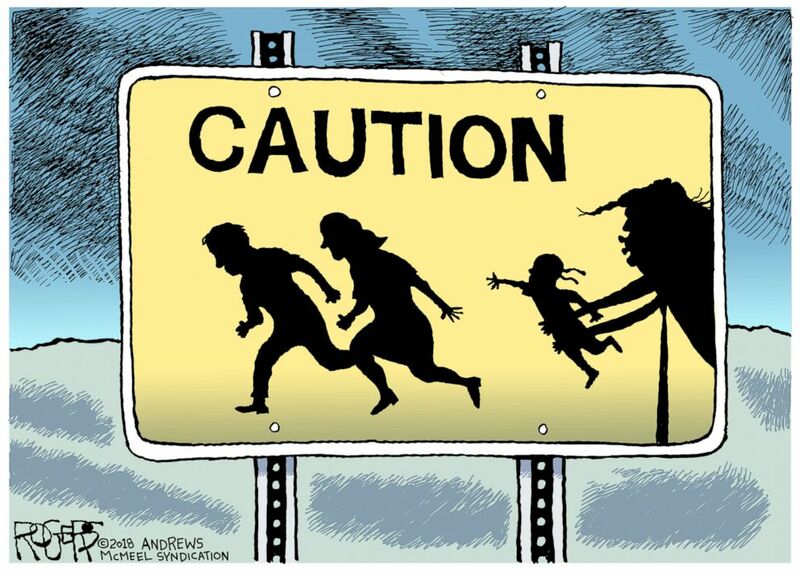 When Rob Rogers met with human resources representatives of The Pittsburgh Post-Gazette this week, he didn't expect to be fired right then and there. Rogers, 59, had been the editorial cartoonist for the daily newspaper in Pittsburgh for a quarter century, winning a number of awards for his work. And although he had clashed with the paper's leadership in recent months over his critical depictions of President Donald Trump, Rogers said he was trying to give them the benefit of the doubt. But he left Thursday's off-site meeting with a severance offer -- which he said he has not yet signed -- in place of his employee identification badge. Rogers said he should have seen it coming and, in hindsight, he realizes he actually did. "The only thing I think they had in mind was, 'We need him out of here,'" Rogers told ABC News in a telephone interview Saturday morning. "They were determined to either get me in line or fire me, and that part is clear to me." There had been a shift at the traditionally left-leaning newspaper in the months and years leading up to Rogers' ousting. Rogers, who was hired in 1993, said he first noticed a change at The Pittsburgh Post-Gazette in 2010 when the editorial board endorsed Tom Corbett, then-Republican candidate for Pennsylvania governor. 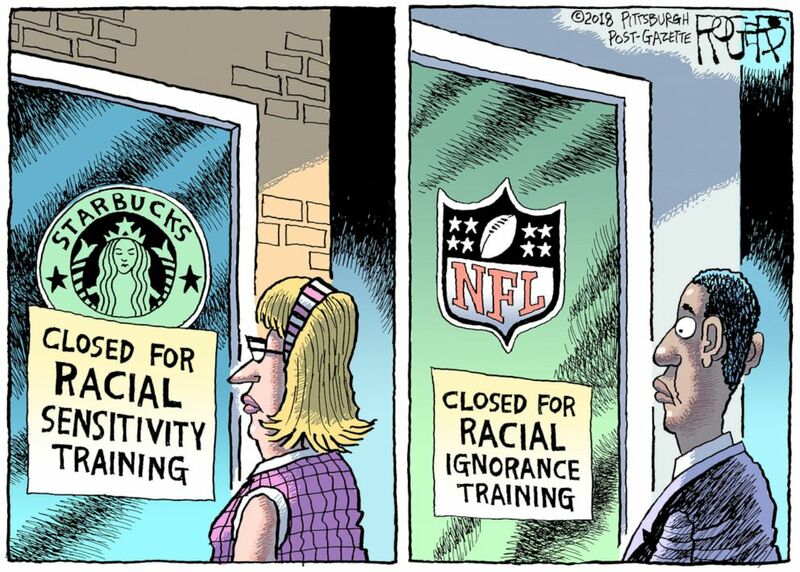 Editorial cartoon by Rob Rogers. Then, in late 2015, Rogers said the newspaper's chairman, publisher and editor-in-chief, John Robinson Block, indicated to the editorial board that they might endorse Trump for president, leading the editorial page editor and Rogers' longtime supervisor, Tom Waseleski, to take a buyout and retire a few months later. Rogers, who was drawing critical cartoons of Trump, said tensions were high within the editorial board and he was nervous about navigating the waters without Waseleski. But he decided to meet with Block to address the elephant in the room. "I just said, 'I'm going to continue drawing Trump.' And he said, 'Well it's not that I don't want you to draw Trump but they're just so negative and they're just so angry.' And I said, 'I disagree,'" Rogers told ABC News. The meeting ended with Rogers and Block both agreeing that the paper shouldn't be publishing cartoons about Trump every day, which Rogers said he wasn't doing at the time and didn't want to do anyway. So Rogers returned to his drawing table but still got push-back from Block, mostly on cartoons that involved Trump or racial issues, he said. "I was still doing only an average of two [Trump cartoons] a week," Rogers told ABC News. "I was spreading them out. I was trying to be a diligent journalist and cartoonist in terms of my topics ... I felt like I was doing a fair balance of Trump versus non-Trump." Rogers, who has been critical of Democrats as well, said he often made changes to his sketches at an editor's request before going to press, and the publisher wouldn't always provide an explanation if his cartoons were killed. But Rogers said he began to notice a pattern in the ones that wouldn't get the green light. "What I felt like they wanted were humorous cartoons that just poked light fun at Trump if I was going to do something on Trump. But they didn’t want anything that was too provocative or too scathing or too critical," he said. In January of this year, the editorial board ran a piece defending Trump's use of the term "shithole countries" when referring to African nations as well as Haiti and El Salvador. The editorial, titled "Reason as racism," sparked outrage among current and former employees at the newspaper, including Rogers who described it as "blatantly racist." Then, in March, Block named Keith Burris the editorial director over both The Toledo Blade and The Pittsburgh Post-Gazette, making him Rogers' new supervisor. "I knew then, I knew at that moment I was counting the days," Rogers told ABC News. "I knew he was brought in to be the guy to get me in line." Rogers said he met with Burris over lunch that month, who informed him that Block believes the editorial cartoonist should reflect the opinion of the paper's publisher. "And I said, 'Well that’s news to me because that’s not the condition under which I was hired and I don’t believe that's the way most editorial cartoonist work,'" Rogers told ABC News. "So I just said, 'I totally disagree,' and we left it at that." Up until this point, Rogers said only a few of his cartoons would be nixed every year. But over the next three months, he had 19 cartoons or proposals that were rejected, including six in a single week that illustrated a range of topics. 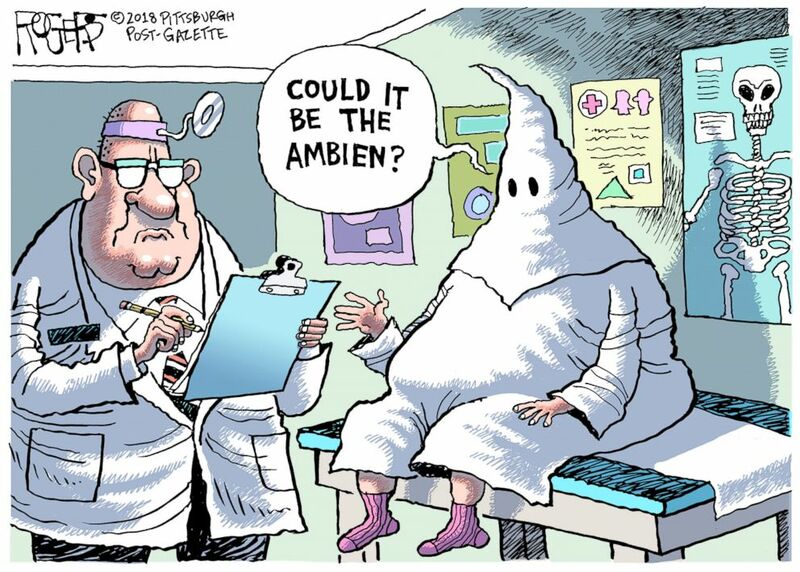 One of them -- depicting a Klu Klux Klan member in a doctor's office asking, "Could it be the Ambien?" -- was even killed after it was sent for syndication, according to Rogers. Neither Block nor Burris responded to ABC News' requests for comment. 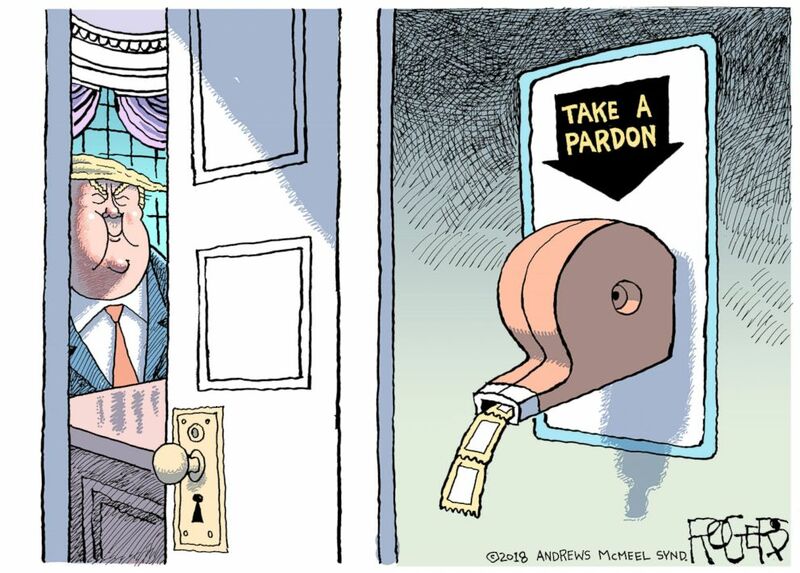 In an interview this week with The Pittsburgh Post-Gazette, Burris said he didn't "suppress" his cartoons but was trying to address the "tone and frequency" of his drawings of the president. He claimed that Rogers was not willing to "collaborate." "We tried hard to find a middle way, an accommodation to keep him at the paper," Burris told The Pittsburgh Post-Gazette. "We never said he should do no more Trump cartoons or do pro-Trump cartoons," he added. "For an in-house staff cartoonist, editing is part of it. Rob’s view was, 'Take it or leave it.'" Rogers told ABC News that Burris' comment about him being unwilling to work with editors is "a total lie." "I was more than willing to work with him and I changed my cartoons many times. But the thing I would not do was draw something I did not believe in or water down what I was trying to say," Rogers said during the telephone interview Saturday. "Sometimes we’d reach an impasse." Rogers said the stalemate with the newspaper's leadership got to a point where he would send emails defending his sketches and asking why they were spiked, but he'd never hear back. "I'd just get crickets," he said. "Then it wouldn't be in the paper." On May 31, Rogers sent them a letter requesting an explanation for the rejections and stating that he was unhappy with the current work situation and they needed to find a better solution. He also reiterated his love of his job and offered possible options, such as moving his cartoons to the op-ed page, according to Rogers. They responded a few days later, calling him in for a meeting with human resources representatives and giving him a set of "guidelines" to follow. Rogers said he told them "no" and explained why it was "totally unacceptable." "I thought to myself, 'Well, they're clearly not doing anything to keep me," Rogers told ABC News. On June 6, Rogers decided to take some vacation days while still trying to iron out the issues with his employer. He didn't hear from them for a week until one of the human resources representatives returned his phone call and suggested they all meet again Thursday, according to Rogers. "That's the day I was fired," he said. Rogers added that he and his lawyer are still in negotiations with the newspaper over the severance deal that was offered to him. When The Pittsburgh Post-Gazette published its own article on Rogers' sacking, it included a statement from the newspaper's chief human resources officer, Stephen Spolar. "The Post-Gazette does not provide details about employment matters, but in light of Mr. Rogers’ public comments today, we do want to acknowledge his long service to the newspaper and our community. Any further discussions will be conducted with Mr. Rogers as a private matter," Spolar said in the statement. Spolar has not responded to ABC News' requests for comment. Pittsburgh Mayor Bill Peduto issued a statement about Rogers' termination, saying it is "disappointing" and "sets a low standard." 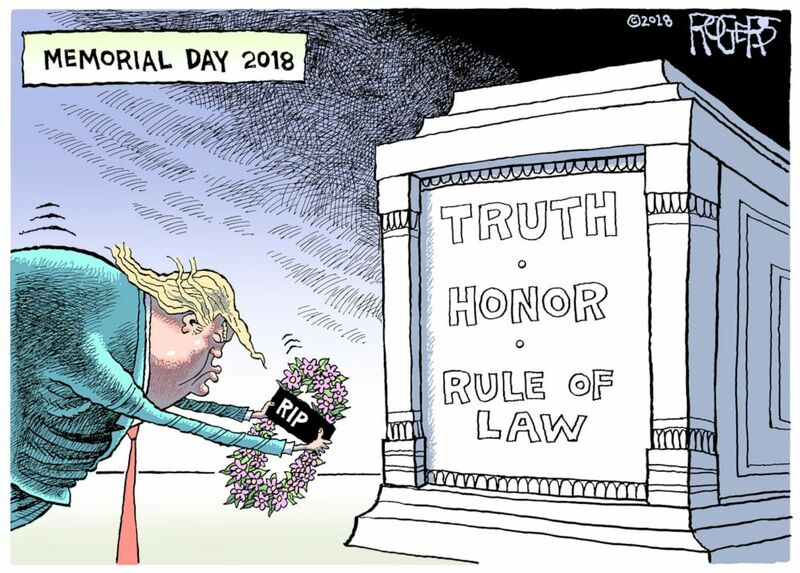 "The move today by the leadership of the Pittsburgh Post-Gazette to fire Rob Rogers after he drew a series of cartoons critical of President Trump is disappointing, and sends the wrong message about press freedoms in a time when they are under siege," Peduto, a Democrat, said in the statement Thursday. 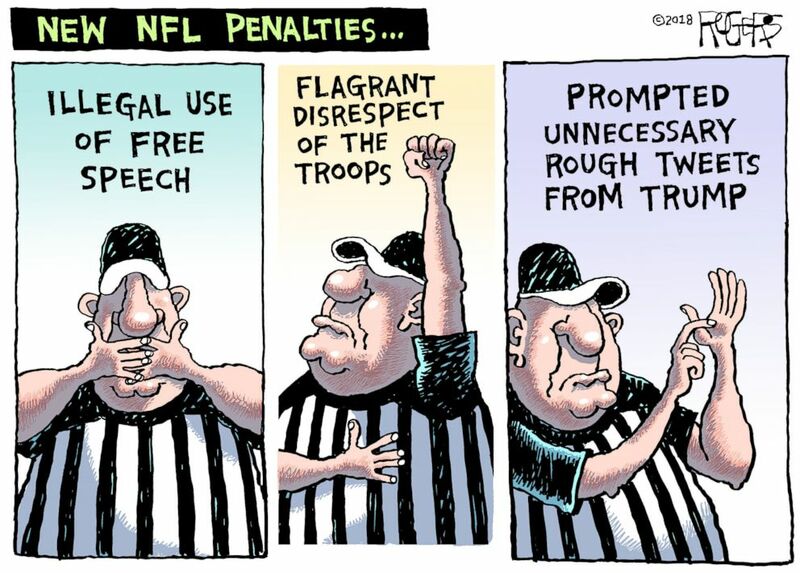 "This is precisely the time when the constitutionally-protected free press –- including critics like Rob Rogers -– should be celebrated and supported, and not fired for doing their jobs. This decision, just one day after the President of the United States said the news media is 'Our Country's biggest enemy,' sets a low standard in the 232-year history of the newspaper." The Pittsburgh Post-Gazette last published one of Rogers' editorial cartoons on June 5 -- a sketch criticizing the United States for waging a trade war with Canada, Mexico and Europe. His last cartoon to appear in the newspaper before that was on May 24 -- a sketch lambasting the Republican-led Congress alongside a remark from Rogers, saying, "I really hope the midterm elections stick it to cowardly Republicans who won't stand up to Trump or defend the rule of law. Disgusting." Rogers said the changes at the local paper are emblematic of a wider issue happening in newsrooms across the country, at a time when the sitting president has declared the media America's "biggest enemy." "It's not about me. It's about where the paper's going, where the country's going and what journalism means in this country and whether it means a variety of opinions or just one opinion," he told ABC News. "By only representing one view that is favorable to the president, you're not keeping him accountable." Still, Rogers said, "They've not silenced me." "I love doing what I do and I'm going to continue doing it in some form, whether its for syndication or for a more permanent outlet," Rogers said. "But as long as this president is in office, I'll be drawing."